Recycling in the bathroom? Say what? Do you remember to recycle empty bottles and containers that you use in the bathroom? This is one of those areas that I would like to try and be better about recycling. In the kitchen, it is easier because the recycling bin is near by. But in the bathroom, especially if it is a smaller container I often just toss it in the trash without thinking instead of taking it out to the recycling bin. 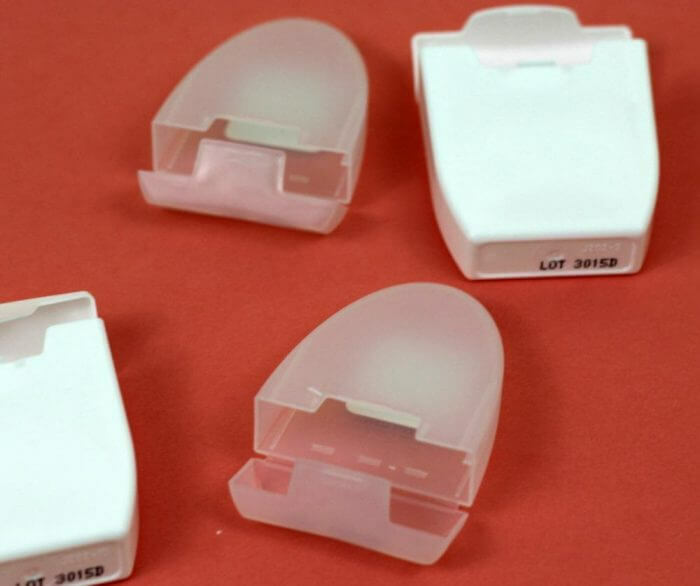 I have a few ideas to help myself and my family to do a better job recycling in the bathroom, starting with dental floss containers. I am not alone in forgetting to recycle in the bathroom. One-third of regular recyclers (34%) admit that it never even occurred to them to recycle in the bathroom! Additionally, researchers found that the largest obstacle when it comes to recycling personal care products in the bathroom is a lack of tools and resources; only one in five recyclers have a recycling bin in their bathroom. To remedy that situation I am placing a special container in the bathroom to help us remember to recycle all our empty shampoo and conditioner bottles, soap bottles, mouthwash bottles, etc. Sometimes it is hard to know what can be recycled and what can’t. A great resource is the Care To Recycle® program from Johnson & Johnson Consumer Inc. You can go to visit www.caretorecycle.com to find out more about which products are or are not recyclable. 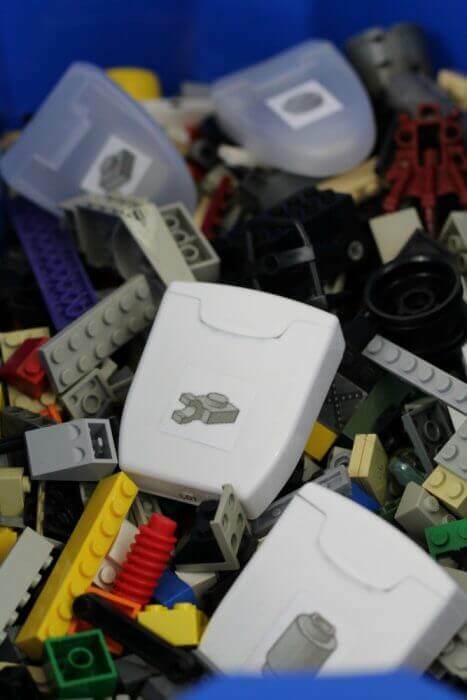 Dental floss containers are in fact not recyclable, but I have thought of a creative way to reuse them for Lego storage. 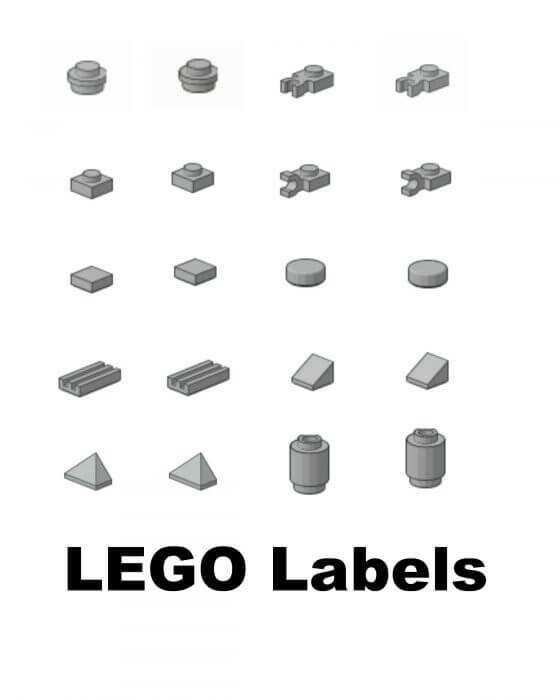 I am always hunting for the tiny Lego pieces. 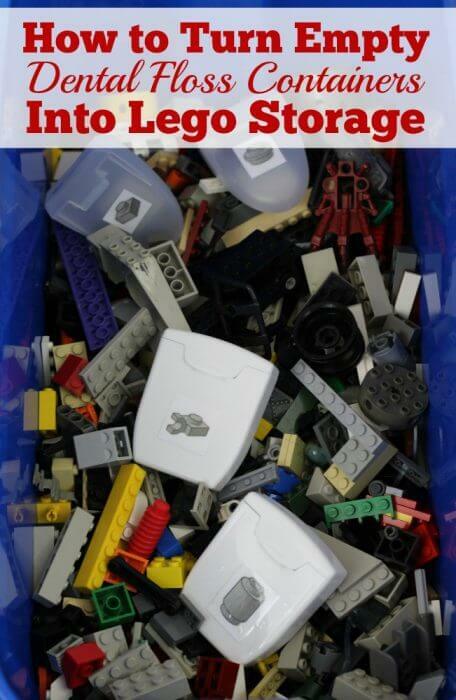 My kids somehow can never find what they are looking for at the bottom of the Lego bin which is where all the tiny pieces end up. 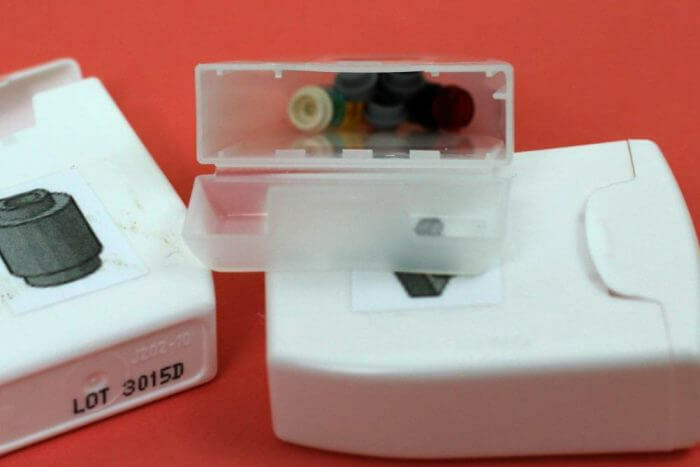 So I thought if I could reuse the dental floss containers to hold all the little Lego pieces then I won’t have to spend all that time sorting through Legos to find the one piece that my kids just have to have. 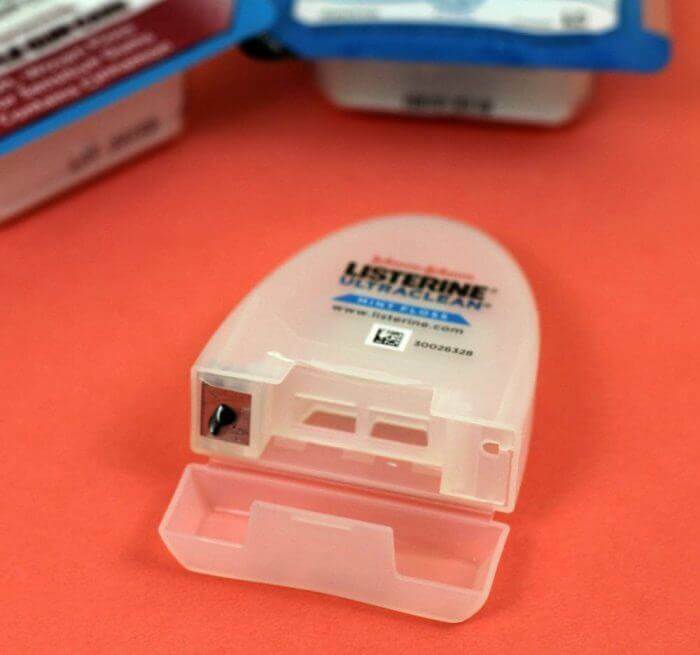 When the floss is all gone, you can pop out the inside part of the container. You can use your fingers or the tip of a small flat head screw driver to pop out the inside of the container. Peel off the labels from the empty containers. I made a sheet of printable labels that you can print and use too! 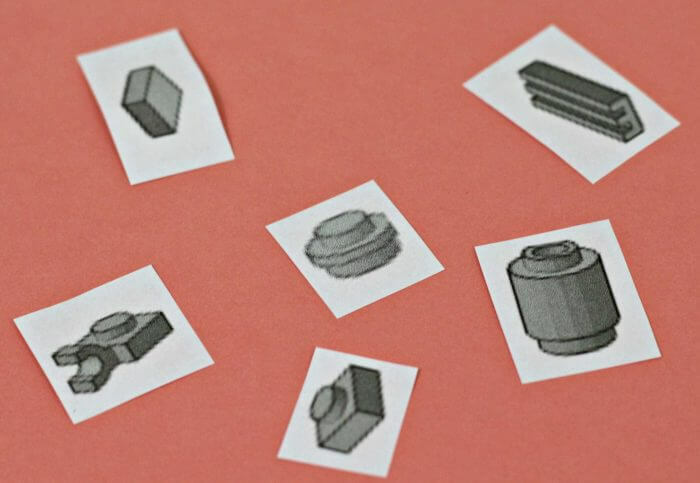 Print out the sheet, then cut out the individual Lego shapes. 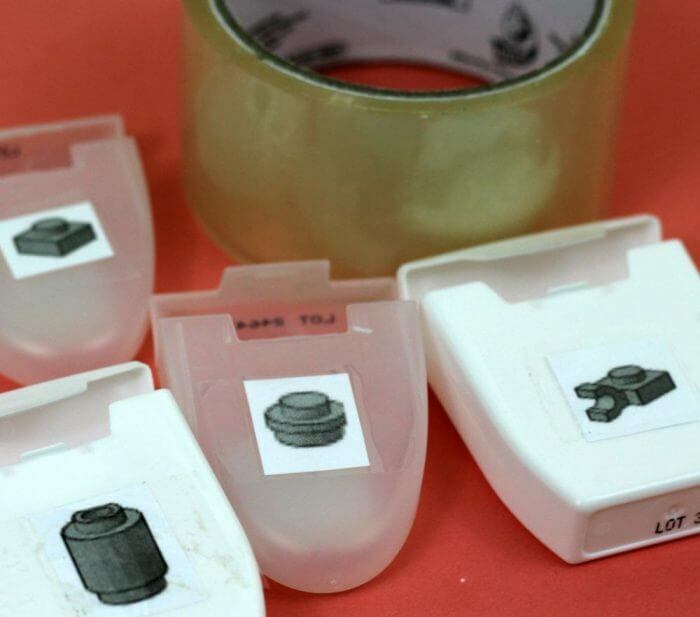 Tape the shapes onto the empty dental floss containers using clear packaging tape. Now all that is left to do is to find all those tiny pieces one last time, sort them, and put them in the right containers. 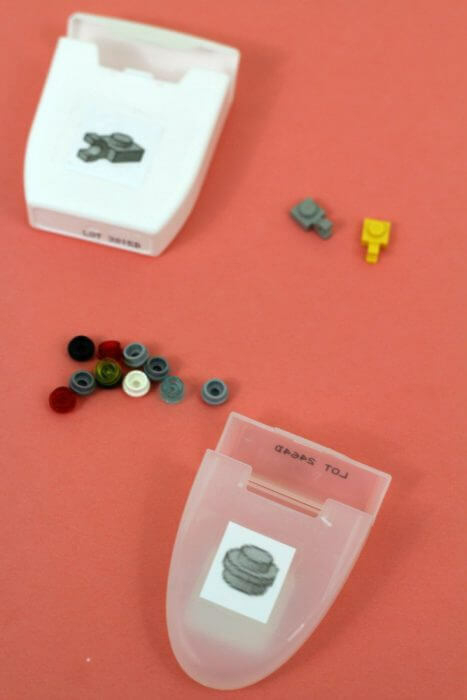 Reusing empty dental floss containers for Lego storage is a great way to encourage your kids to recycle and an excellent way for you to get creative with your kids. Together you can come up with even more ways to recycle and learn about the lasting impact of recycling. Be sure to visit the Johnson & Johnson Consumer Inc. Care To Recycle® website and tell us in the comments below which ideas you are going to try to help improve your recycling habits in the bathroom.